As most of you already know, during the last months I have been studying Rigging and Tools developing in Maya full-time. This is the result. There are several Rigs and Tools that haven’t been included in this Demo. Nevertheless, I will try to post about them as soon as possible. Enjoy ^^. Click as much as you want!! It does nothing!! This afternoon i would like to show you a facial rig i finished last week. About the rig, all the deformations has been done using blendShapes, an skinCluster with two joints to control the head and the jaw, and finally some deformers were used to get the squash stretch deformation. All the work has been done using Maya 2016. When i started rigging in Maya, i found the way of weighting, using mainly painting tools, a little weird in some cases. It was quite annoying to weight some vertices in fast and accurate way. 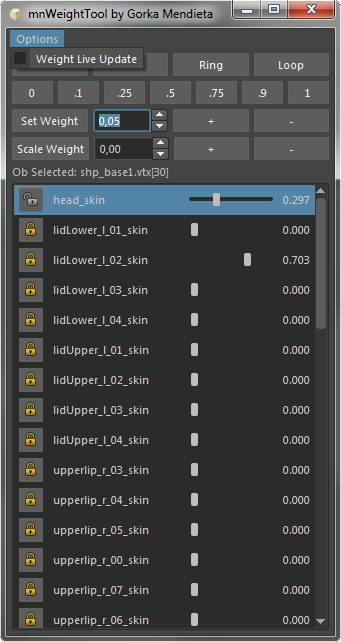 So i decided to develop a tool that emulates the weigting tool that is available in 3D Studio Max. Using this tool, it is quite easy to set, scale, add or substract a small amount of influences from a pool of vertices with just a couple of mouse clicks. I found it astonishingly fast weighting fingers, lips, eyelids, and generally, places where i want the weight to be decreasing following loops or rings. It has been developed using Python and PySide with custom Widgets ( for every row in the list of joint influences ). I have also added the possibility of Live Update the scene while user modifies influences using sliders shown in the picture, thought this option might become slow depending on the number of vertices being modified. Anyone interested in using it, just give me a little whistle!! It has been quite a long time since i don’t post anything. That’s because during the last two months i have been going deeply into Rigging using Maya. In the way, i have also learnt Maya Python scripting and Pyside. 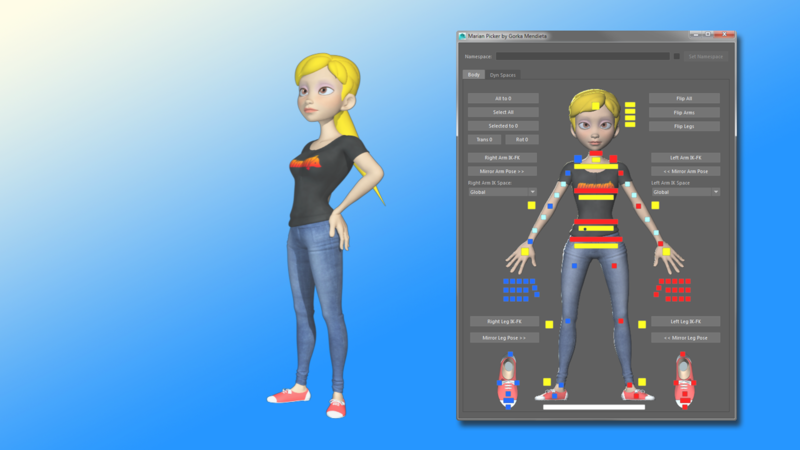 The previous image shows the first character i have developed in Maya. It’s name is Marian and has quite useful features as Stretchy Limbs, Non-Roll Twisting, Space Changes and a couple of interesting technics i have learnt here and there. Currently i am developing a Dynamic Space Change tool that for sure will be integrated into the Picker. A demo video showing its main features will be soon available!! After a titanic fight againts dark forces, RapidSelection is finally published and available in the Asset Store ( hahahaha ). Simple yet usefull. 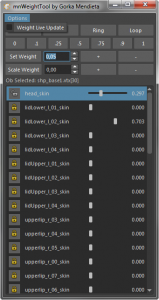 RapidSelection is a Unity Editor extension that allow users to manage selections in an intuitive way. By using the same editor styles built-in windows use, and tracking keyboard and mouse events, make Rapid Selection‘s workflow easy and straight. At the end, the development process has been quite long. The first and second prototype was working exactly as this one, but i realized that the workflow was not intuitive. The user had to make a couple of mouse clicks just to have a selection saved. Moreover, the UI was not look like Unity UI. So finally i decided to go a little deeper and understand how IMGUI works, and try to imitate Unity UI. I am very grateful to David Sevilla for the amazing work he did with the design of all the necessary images for the Store. This way we’re going to get a random number, and use it to spawn the item in position index of the array. (just what we want :)) The cons of this method is that all the items in the array have the same probability to be spawned, and sometimes we don’t want this behaviour. Sometimes we want to define a probability for each of the available items. Here it comes Weighted Random. Weighted Random allow us to define a weight for each item in the array of available items, in consequence, we modify the probability of that item to be spawned. ( I have just used it to modify the probability a life is spawned in a game. I did’t want a life to be spawned with the same probability as a coin :)). Animalada is an animation festival that will happen in Seville, Spain, in December from 2nd to 4th. It tries to present to all the social fabric the world of animation, also trying to create relationships between professionals, and also giving novel animators the chance to present their works and meet people within the same sector. I am lucky in that i’m going to do a little workshop introducing Blender 3D ( http://www.blender.org/ ), mainly focused on animation. As i said, it would be an introduction to the software, but for sure all people will learn something, including me. With this name ( Cosmos Laundromat chapter 1 ) Blender institute brings to light his new Open Movie. As always, they sell several versions, all of them with all the Blender content used to render the movie inside. Its a super opportunity to learn a lot about Blender, about new capabilities, and to get the most of this amazing open source 3d software. Althought i have not been using Blender for a long time i am still in love with it. So, this article tries to explain a way of using MaxScript Struct as an Object ( Object Oriented Programing ). The main reason to do that is to organize our code and our information structures inside MaxScript, cause when a script start to grow and become really large, our organization is one of the most important things to understand what we are doing, write less mistakes, find mistakes faster, and let other people to read and understand our code.